Net Zero Waste Inc. designed, built, owns and operates a food, green and agricultural waste commercial composting facility for Abbotsford City. This state of the art operation will be responsible for the treatment of organic waste for all 150,000 or so of Abbotsford’s residents. It will also provide a much needed processing option for Fraser Valley commercial and agricultural waste management. The interesting thing about Net Zero Waste’s facility is that it will use an in-vessel design by having the standard Gore Cover Processing Model in a building with secondary bio filter control. In addition to that, through recovering waste heat energy, the facility will use the high temperatures generated below their compost piles to provide heat to greenhouses or other indoor agricultural initiatives. Not only will they improve the sustainability of this type of waste management, they’ll also improve the the sustainability of energy consumption. This initiative will also encourge the construction of new greenhouses in the area. Agricultural initiatives already underway by the landowner have always been a big priority of the organization. Hog barns have been redeveloped to house indoor farming and vermicomposting. At the core of NetZero Waste’s operational strategy around is the Gore Cover System which is based on a membrane laminate technology similar to that of the Gore-Tex fabrics used for outerwear and footwear. This proven technology has been used in more than 150 plants in 26 countries world wide. Not only is it an efficient way of dealing with organic waste, it has enormous side benefits: including odour reduction of 90-97%; Bio-aerosol Emissions reduction of greater than 99 percent; less than 1 KWH/ton Energy Requirement and a three square feet/ton space requirement. Gardening 101: Why Use Sea Soil? Sea Soil is one of the easiest ways to introduce the nutrients your plants need into your garden. The term ‘Sea Soil’ might be new to you and it might make you think that it’s soil dug up from the sea bed. Actually, it’s soil that is comprised of 50% forest fines and 50% fish and it’s referred to as ‘natures best organic’ soil. In case you were wondering, ‘forest fines’ are bark and forest soils that have been composted over two years to provide your plants with amazing micro organisms and fungi that break down nutrients so that roots can absorb them. Other major benefits of Sea Soil include balancing the pH of the soil, better moisture retention and high levels of organic matter – without needing to use chipped wood or cedar. Sea Soil is good for your plants and the environment and it’s available for both container gardening as well as regular gardening. We have just received a shipment of this locally produced Sea Soil and are confident it will be a great addition to your garden. Come in and get yours today so that your Spring planting will get a good, healthy start and to add a boost to your existing garden soil. In Part 1 of this series, we explained how to start your seedlings indoors and in this article, we’re going to tell you how to go about transplanting seedlings outdoors. Transitioning them from their indoor environment to the outdoors requires some preparation. We hope you’ve enjoyed the process of beginning your adventure into gardening so far and we hope you’re excited to watch your seedlings grow! It won’t be long and you’ll be enjoying the fruits of your labor with mature, strong and healthy plants. But, be warned! Transplanting seedlings outdoors is a gradual process. Don’t be fooled by that balmy Spring sunshine in March! It’s still too early! We could get frost right up until after the May long weekend. Putting those tender seedlings you’ve nurtured so carefully outdoors could end in disappointment if they are destroyed by frost or a chilly wind. Double check on the seed packet or with your local garden center before transplanting. Before transplanting seedlings outdoors, you will need to acclimatize them to the new environment over time. About a week to 10 days before you plant on transplanting them outside, take the seedlings outside for a few hours a day. Make sure they’re in a sheltered spot . Begin them in dappled shade gradually moving them into the direct sun over this period. Remember to water them regularly as they will dry out quickly outdoors. This process is known as ‘hardening’ the seedlings. After the hardening period, the seedlings are ready to transplant. Choose your time to do this carefully. Don’t transplant seedlings in the middle of a scorching hot day in full sunshine. They are still a little tender. Instead, plant them early in the morning (if we should be so lucky as to get scorching hot days at that time!) or choose a cloudy day. Check whether your soil is ready to be planted, you can take a handful of it and try to make it into a ball. If it holds that shape, it’s too wet and you will have to wait for it to dry out a bit. If you make the ball and it crumbles, then the soil is ready. Chances are, you’ll be standing near or in the soil you’re testing. Check your footprints in the soil to see if they look shiny and wet. If they do, it’s still too wet. Once the soil is ready, then use your garden fork to stir it up well to aerate it. Leave it ‘settle’ for several days. As seedlings will do better when the soil temperature is warmer, raised beds may be a good idea. Creating a raised bed allows the sun to warm the soil around the roots more than if the seedlings are planted into flat ground. Add compost or rotted manure to the soil. Check with your garden center for recommendations on which additives will be best for your seedlings. Using a small trowel, create holes in which to plant the seedlings. Phosphorus should be at the root level to ensure that the roots grow strong. This can be made available to the roots by placing a mixture of 15-30-15 starter fertilizer mixed with a gallon of water. The exact amount of the fertilizer should be determined by the type of seedling you’re planting, but will generally be either 1 or 2 tablespoons per gallon of water. Add a cup full of the mixture into each seedling hole you’ve prepared using a small trowel. Water the seedlings well so that the moisture soaks down to the roots. Add a layer of mulch over top of the soil to stop the moisture evaporating. Now you know how to go about transplanting your seedlings outdoors! Great job! Remember that we are here to help you with any of your questions or concerns. A little friendly advice goes a long way to ensure successful gardening, so don’t be shy… come in and chat with us! 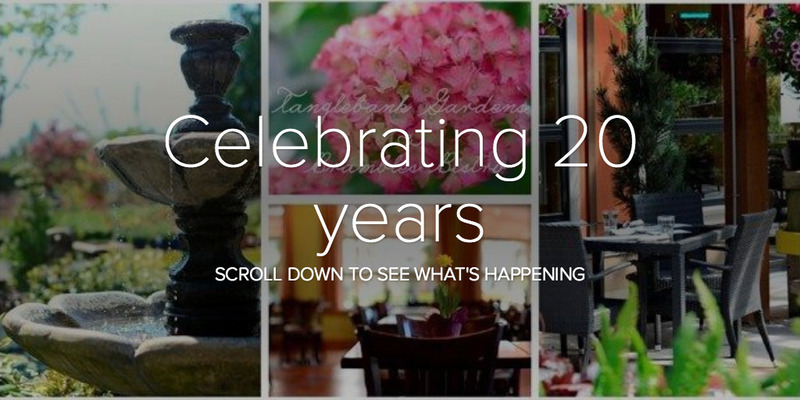 To celebrate this awesome anniversary, we’re launching this new look, interactive newsletter. Please scroll through and enjoy! Just click on the image below and the newsletter will open in a browser window. Scroll through and enjoy! (NOTE: Browser *cookies must be enabled to view this newsletter otherwise it will not display or scroll. ) *Enable cookies in Firefox, Chrome, Safari.